There is only a number of times you can say when describing a film musical "You won't like it if you are not a fan of musicals to begin with" before you start sounding like a broken record. Yet, that is what it comes down to with Clint Eastwood's film adaptation of stage musical Jersey Boys. Eastwood has made the decision to keep much of his latest film true to the stage production and this decision may not sit so well with many, in particular those who are generally not fans of the musical genre. Yet, those who are theatre buffs and musical lovers will be quite taken by Eastwood's latest film which reminds us just what a wonderful filmmaker he is. Jersey Boys is the story of the 1960's pop sensation, The Four Seasons. Focusing mainly on the life of lead singer, Frankie Valli (John Lloyd Young), the film is based on the Broadway musical of the same name and tells the tale of the boys who grew up on the mean streets of New Jersey where opportunities were hard to come by. When band members Valli, Tommy DeVito (Vincent Piazza) and Nick Massi (Michael Lomenda) allow songwriter, Bob Gaudio (Erich Bergen) to join their group, they find the winning combination to become the stars they are remembered as. However, fame comes at a price as the boys find out. Clint Eastwood's film is an ode to the Broadway musical. 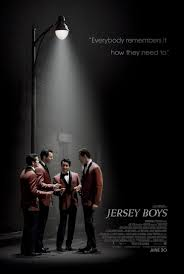 It is a biopic, but Jersey Boys wants to stay true to it's theatre roots rather than pretend that it is a musical made for the screen and it is no surprise that the screenwriters, Marshall Brickman and Rick Elice are also the musical book writers. There is no mistaking the film's Broadway roots as there are various elements which seem more at home on the stage than on the screen, but Eastwood wants us to be reminded of this. Much of this film will be bordering on torture for people who have no interest in musical theatre. While Jersey Boys isn't that type of musical where the characters burst into song at any given moment, there are features which seem out of place on screen, yet would seem right at home on stage such as characters talking directly to the audience and the finale number. The screen gives Jersey Boys a greater area to play with and opportunity to use the directorial expertise of Eastwood to make it work on screen without forgetting where it began. Jersey Boys is a lot of fun and has a great nostalgic atmosphere. The 1950's and 60's are visually recreated with style and accuracy in the suburbs of New Jersey as well as in the big city. The costume design is gorgeous and production design such as that of the streetlamp lit streets and home interiors are perfect for the times. The camera angles Eastwood employs throughout the film are incredibly interesting and the lighting he uses for the character's profiles adds an intriguing edge. The music is, of course, a highlight of the film. The soundtrack contains all The Four Season's greatest hits and watching them be sung in the film by the four lead actors is extremely reminiscent of seeing of seeing the real Four Seasons perform live. However, the film itself is not as powerful as it is entertaining. The band's successes do not feel as high as they should, and their lows not as emotional as they could be. The scene where the band is ultimately breaking up is probably the most powerful scene in the film, and not to mention quite possibly the most entertaining scene that doesn't involve music. However, the saddest scene which should be a sure tearjerker, the characters do not show enough emotion for it to be so. Eastwood was questioned regarding his decision to cast Broadway musical performers rather than big name Hollywood stars, but when watching Jersey Boys it is a decision which proved to be the right one. It would seem that people would take the characters even less seriously if they were distracted by well known movie stars playing them. 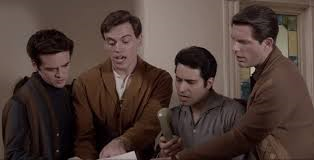 It is not even guaranteed that there would be many film stars out there who would be able to sing with the same incredible vocal range of Frankie Valli the way that John Lloyd Young does. Young does well in the lead, but doesn't pack the emotional punch which should be part of the role. He also falls into the trap which was going to be inevitable when he is playing the same role on film as he does on stage which is of sometimes overemphasising his facial expressions. On stage this is a necessity so people in the back row can see what people in the front row could, yet it is nowhere as necessary on screen. However, no one can deny that his performance and vocal skills are extraordinary. Vincent Piazza is wonderful as Tommy DeVito. He is a convincing bad boy and everything about his performance radiates this. Erich Bergan, who plays Bobby Gaudio is also very good. His performance starts off as slightly comical and light, but becomes extremely likable and very witty during the film. Michael Lomenda is fine, but his character, unlike that of Bergen's, becomes more unintentionally comical throughout the film. While he is angry, the audience laughs and therefore cannot be taken seriously. Clint Eastwood also makes an extremely cheeky cameo, but a very entertaining and memorable one. It cannot be stressed more that Jersey Boys is not a film for people who are not fans of musicals in general. Clint Eastwood's direction is beautiful and it is glaringly obvious that he cares greatly for the Broadway version. Therefore, this is for the people who do care as much as Eastwood does for this.